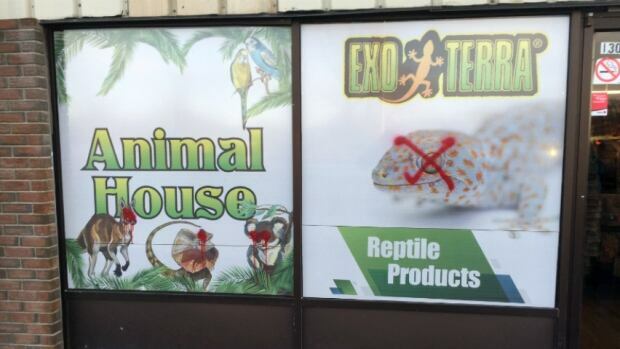 A pet store owner in Okotoks, Alta. said he’s been forced to shut down his business after multiple attacks by animal rights activists. 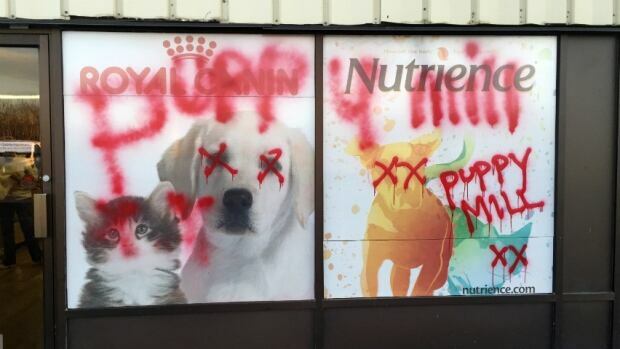 When employees at the Animal House pet store showed up to work Friday morning, they were greeted by the words “puppy mill” spray painted on the front windows. Staff said it is only the latest in a string of bullying, slander and harassment incidents the store has faced. “People have been coming into the store, they’ve been screaming, they’ve been shouting, they’ve tried to knock things off the shelf, they’ve threatened me and the staff, they’ve threatened to beat us up and take the puppies,” said store manager Jessica Lee. It’s gotten so bad, Lee said, that the store has had police on standby for the past few days. Protester Chelsea Kirker with the group Albertans Against Puppy Mills said the graffiti has nothing to do with their group and it damages their message of wanting to outlaw the retail sale of puppies in the province. Kirker said she has heard of the store selling multiple puppies that were discovered to be sick with parasites shortly after being sold. She said she believes the store shutting down will likely not be the end of the store’s puppy sales. “I personally feel that even though they are closing their storefront here, they will continue to sell puppies elsewhere through Kijiji [or] online. They may even open up a new store,” Kirker said. Activists said they believe the store supports puppy mills. Store owner Ty Marshall said in a Facebook post the rumours they use puppy mills are blatantly false. He said all animals come from small ethical breeders and are seen by vets before being sold. Puppies at his store are also vaccinated and dewormed. Lee said the store even works with the SPCA to ensure the dogs are cared for. The store has a vet on standby and the staff works hard to make sure puppies get basic training before the animals are sold. Animal House will close its doors after all inventory is sold, which they believe is likely to be sometime next month. RCMP ask that anyone with any information about the vandalism incident should contact 403-995-6400 or Crime Stoppers.